Fashionably crafty and full of fun, Dizzy dreams of traveling to Auradon, hopeful that one day she will follow in her friend, Evie of the Isle of the Lost's, fabulous footsteps. 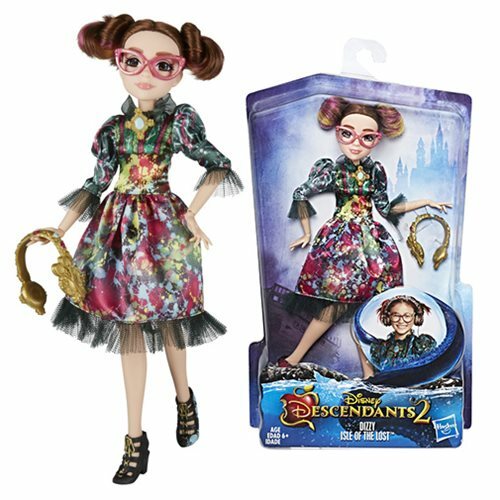 Inspired by the movie, Disney's Descendants 2, this Dizzy fashion doll comes wearing a playful paint-splatter dress, headphones, medallion necklace, pair of boots, and her signature glasses. Kids can imagine awesome adventures with Dizzy on the Isle of the Lost. She's a beautiful addition to any kid's modern-day Disney adventures. Includes doll, outfit, glasses, headphones, and pair of shoes. Ages 6 and up.